OFAWC Events - Get your ticket NOW! Josh Scott will be here from Moa Brewing Company and we will have live music from the blues band Blueshounz featuring Judy Berry. 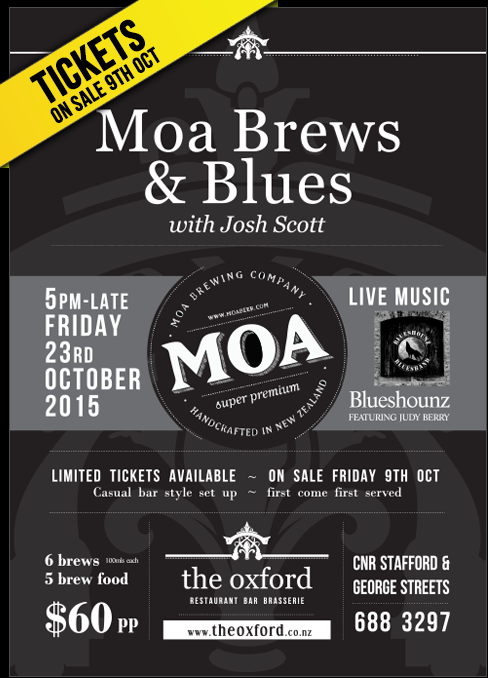 Josh Scott established Moa in 2003 and was one of the pioneering founders of the recent craft beer movement in New Zealand. Josh has almost a lifetime of home-brewing experience (beginning at the age of 13). When Josh returned home from overseas he was able to use knowledge and techniques learned while studying and winemaking in Sancerre (France) and Napa Valley (US) to create a New Zealand first by employing methode traditionelle techniques in Moa’s brewing. This, in conjunction with Josh’s focus on structure, texture, balance and drinkability, gives Moa its distinctive winemaker’s spin on beer. 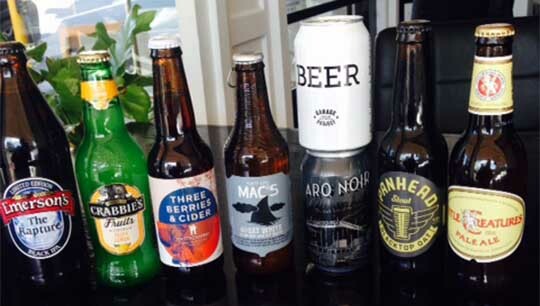 TICKETS: $60 gets you 6 Moa beer tasters (100mls each) and 5 beer food matches. Live music all night. Limited tickets will go on sale at The Oxford from 9th October. Please note: this event will be a casual bar style set up, not a seated event, we are moving out the tables and putting in bar leaners, and not reserving tables so it will be a first come first served. We can offer set menus and Christmas feast menus to suit various budgets . We have mulled wine and pimms cocktails too. We can do breakfasts / long lunches, morning/afternoon teas, platters in the bar or a full degustation dinner. Its all up to you. We have already had many inquiries, so dont leave it until the last minute. Well done to Kirsty who was nominated and selected to attend the Future leaders conference in Nelson this month. This conference is run by the Hospitality Association and is for young people in the hospitality industry that excel at what they do, have a passion for the industry and are considered to be the next generation of hospitality professionals. I am sure you will all agree Kirsty works very hard, and is fantastic at what she does - and for those who keep asking YES we do give her a day off - occasionally! Our kitchen staff have also received some very impressive accolades from the winemakers during our recent dinner series. These guys are lucky enough to spend time eating at some of the best restaurant in the country, and all were blown away by the caliber of skill and talent the oxford showed. Michael and Clarissa are very proud of our amazing team who go above and beyond everyday to make the Oxford the respected success that it is. We invest a lot in our teams professional development, and its great to see it recognised by others in the industry. We are please to be involved with the prostate cancers awareness campaign. The oxford donated $1 for every meal and beer sold on fathers day, as well as having ribbons for sale and collection boxes. We are please to have raised $434 for the prostate cancer foundation. Keep an eye on facebook and our website - it will be uploaded as soon as its ready. Michael & Clarissa Doran and the team. The Latest Scoop from The Oxford - Happy Holidays! Birthday greetings and a little present from the oxford.